It has been a one-two punch for me and comics lately; it seems that I've been hit upside the head by a few well-placed speech bubbles. It has been a one-two punch for me and comics lately; it seems that I’ve been hit upside the head — metaphorically, at least — by a few well-placed speech bubbles. POW! A couple weeks ago, a friend of mine sent along a new web-comic, Strong Female Protagonist, which her daughter Molly Ostertag helps to create. I read the entire series in (almost) one sitting. As the creators describe it, the comic follows the adventures of Allison, a young, middle-class American — a.k.a. Mega Girl — with super-strength, invincibility and a crippling perception of social injustice. Crippling is right — Allison finds that her powers are no match for dealing with the real-life issues she wants to address. Au courant and entertaining, it raises lots of provocative questions, with a few laughs along the way. With a constituency that has limited literacy or short attention spans, or perhaps just a high percentage of youth, comics will get you places a textbook could never dream of going. Like most outreach efforts, the best-received comics are those that reflect the communities and cultures they are designed to serve and speak in their language — both verbally and visually. ZINGO! Last week, the peacebuilding organization Search for Common Ground hosted an event with an illustrator, a conflict-resolution practitioner and a political writer to take a look at the use of graphic arts in the social change realm. Two of the panelists, Andrew Aydin and Nate Powell, are involved in a new graphic novel trilogy called March that will come out later this summer; it will tell the story of Congressman John Lewis and his lifelong fight for civil rights. The seeds for this series can be traced back to the seminal 1956 graphic novel The Montgomery Story, which depicts the life of Martin Luther King, Jr., and his use of the “Montgomery Method” of nonviolent action. It was subsequently used by César Chávez in the United States, as well as in resistance movements in Vietnam and South America. It was banned in South Africa because it taught about the power of ordinary people working together using methods of Gandhian nonviolence to overcome race-based oppression. Then, in 2008, the activist-blogger Dalia Ziada recognized the power of this comic book and translated it into Arabic and Farsi, bequeathing it a new life in Egypt. Some have credited it with a supporting role in the Arab Spring uprisings. BIFFF! Search for Common Ground has also commissioned and published comic books targeting sectarian violence and conflict resolution in Africa and Asia. They have found that comics can be easily distributed and are often attractive ways to to explain complicated information and comfort people in destabilized, post-conflict areas. The comic books can dramatically reduce problems in a demobilization process like the one that happened in Nepal recently — serving as a way to visually illustrate the stages of the process, help impacted people discuss their future, and reduce the potential for manipulation, rumors and more violence. In this setting, where access to any media is very low and there is high illiteracy, comics are particularly useful for communicating essential information. Although reading in general is considered more of a solitary activity in the Western world, Search for Common Ground has found that in some cultures, reading comics in groups has become a way to start public conversations about social change. The organization’s comics that were distributed to the Congolese army created a context for shifting norms, defining new heroes and role models, and helping to establish positive reference points. The adventures of Mopila the Congolese cab driver raise a wide spectrum of issues, such as corruption, police brutality, sexual violence in schools and female leadership. In Indonesia, the comic strips have focused on reducing religious and ethnic violence while encouraging tolerance and educating people about good governance. RAARRG! Comics, by the way, are only part of the wide range of arts that Search for Common Ground uses in its work. The organization also produces award-winning popular TV soap operas that address cultural, ethnic, religious, tribal, racial and socio-economic issues through a storyline based on soccer. Check out The Team — you’ll be cheering! 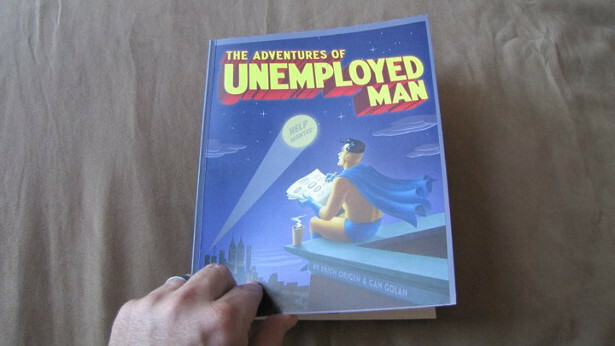 I can’t leave out from this list the Superhero-inspired “Adventures of Unemployed Man.” In it, the Just Us League, FIAS CO, Plan B, The Thumb, Wonder Mother and Everyman take on the economic catastrophe of our time with bluster and brilliance — and with a few economic and political lessons thrown in for good measure as well. Unemployed Man is the manifestation of the duo — Erich Origen and Gan Golan — that also brought us Goodnight Bush, a side-splitting parody of the children’s book with a similar name. WOOOSH! The graphic novel has also been used to tell very personal stories that illuminate broader issues. Persepolis, written and illustrated by Marjane Satrapi about her early life in Iran during and after the Islamic Revolution, is one gripping example. Another is Metro, a thriller based in Cairo, which helps communicate the context for the Egyptian Spring. Created by Magdy el Shafee, it was banned by the Mubarak regime — a move that only speaks to this lowly comic’s power as a political document. KAPOW! 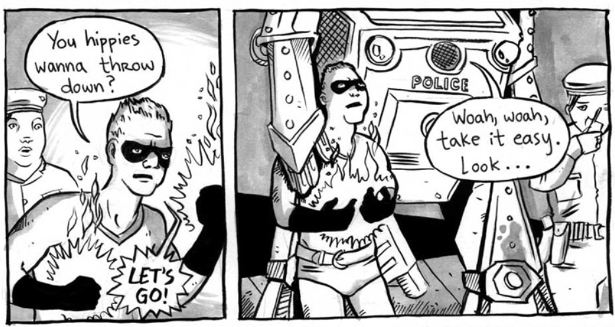 The bottom line is: Activist comic books can pack a big punch. Check one out today! I’m quite fond of “A People’s History of American Empire” a partial adaptation of Howard Zinn’s “A People’s History of the United States” into graphic novel form. Dunno what influence it’s had, but a pretty good comic about peace and social justice. Yup, that one’s in the WNV library! We are working on a comic on the life story of Badshah Khan. Should be finished in a few months! Wow that’s so exciting! I can’t wait to see it.